If you are needing to pay your HOA dues and would like to pay online please click the financial tab and pay dues. You will need to set up an account and have your account number with you. Your account number will be located on your statement. If you do not have your statement, please contact the HOA at 405-421-5983 and the HOA will provide you with an account number. If paying by check or money order, please send it to Springs at Greenleaf Trails HOA, 15100 South Western Ave. Suite 100, Oklahoma City, OK 73170. Payments can also be taken over the phone by contacting the HOA. Please join your neighbors in the annual Christmas walk around on December 6th. Walk around will begin around 7:00 p.m. at the clubhouse. Following the walk around residence will be gathering in the clubhouse for hot chocolate and cookies and fellowship. Happy Holidays!!! Please join me for our 2018 Springs at Greenleaf Trails HOA annual gathering in the clubhouse on Saturday, September 22nd. The gathering will held at 12:30 p.m. following the pot luck luncheon. I look forward to meeting everyone and this will be a perfect time for all homeowners to meet our new residence. If you’re here to pay your 2018 HOA Dues using PayPal, please click “FINANCIAL” above. Note that Pay Pal fees will apply to each online payment. Due Date is February 19th, 2018. Or you may correspond with HOA in regards to breaking your payment up. The Clubhouse now has accessible wifi. 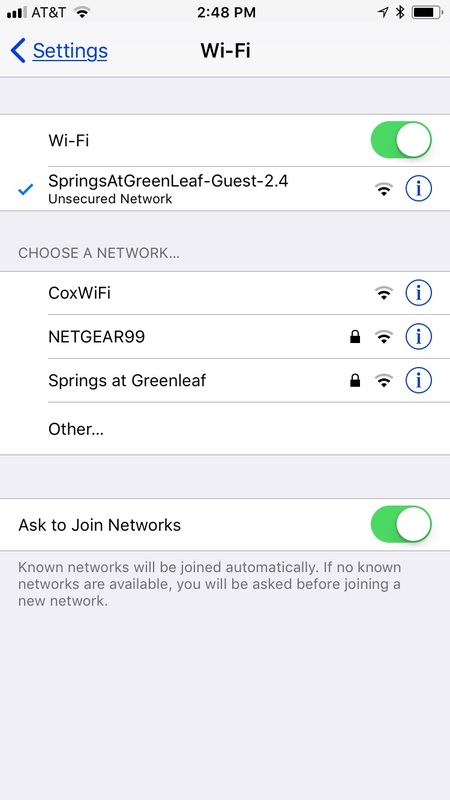 Click on your device settings, click wifi, then select “SpringsAtGreenleaf-Guest-2.4” below.